Is there such a thing as health insurance for families? Home / FAQ / Is there such a thing as health insurance for families? Yes, there are many health insurance plans available for families. The majority of health insurance providers offer plans for employers, individuals, and families. There are also options for low-income families available through most state programs. The free online tool above lets you compare health insurance rates by just entering your ZIP! Health insurance is an important thing to have no matter who you are, but someone with a family has more than themselves to worry about. This can be a particularly stressful situation for someone that is the sole supporter of his or her family. 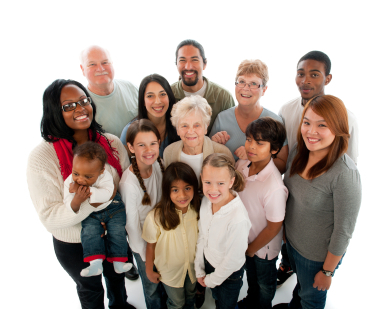 What types of health insurance is available for families? A co-pay plan is probably the type of plan many people are most familiar with especially if they have ever had insurance through their employer. This plan requires the policyholder to pay a small fee for doctor’s visits and then insurance covers the rest. With many co-pay plans, if the policyholder goes to a doctor in their approved network, they will not have to pay any co-pay. This type of plan does have higher monthly premium payments, but many people prefer it because they have to pay less for their actual medical care. A co-pay plan would be a good choice for someone with young children since they tend to have to go to the doctor more frequently. A high deductible plan offers the policyholder lower monthly premiums, but there is a high deductible amount that must be reached before the insurance provider begins paying for anything. Once the deductible is paid for the year, the policyholder does not have to pay anything else until the nest policy year starts. A health savings account is a high deductible plan with a savings account added to it. The idea with this plan is to deposit the money saved by having such a low monthly premium into the savings account and use that money to pay for regular medical care until the deductible is met for the policy year. This special savings account allows the money the policyholder to save in a year to continue to roll over into the next year. This means that with time the policyholder will find it easier to pay for certain medical needs themselves before the deductible is met. A short-term plan is designed for people that are in between certain stages in their life. Most commonly in between jobs that provide medical coverage. This is also a good type of coverage for someone that has just been hired at a new job and is waiting for his or her new benefits to kick in. Most companies require new employees to wait 90 days before their insurance takes effect and a lot can happen to someone or their family health wise in three months. If the policyholder knows exactly how long they are going to need this type of coverage, they can purchase a policy for that amount of time. If the circumstances are more up in the air, they can pay on a month-to-month basis for up to a year. What health insurance options are available for low-income families? If a family does not have the means to purchase their own health insurance and they are not eligible for coverage through their employer, they should look into Medicaid. Medicaid is a state funded health insurance program available to individuals and families that cannot get health insurance anywhere else. There are certain qualifications to be considered eligible for Medicaid coverage and these qualifications vary by state. To learn more about this program you can visit the Medicaid website. What type of health insurance is available through my employer? There are typically two types of insurance available through an employer an HMO or a PPO plan. An HMO plan costs less, but the policyholder is restricted to choosing their family’s doctor from an approved provider network. If they decide to go outside of the network, their insurer might not cover their medical costs. If the policyholder needs to go to a specialist, they would first have to go to their primary network doctor for a referral. If the doctor does not think the specialist is necessary, they can refuse to give the referral and the policyholder would have to pay for whatever care they receive from the specialist. Those enrolled in a PPO plan would be able to choose to go to any doctor they want. If they did choose to go to a doctor in the network more of their costs would be covered by the policy. Just enter your ZIP now to compare health insurance rates in your area!